The posting of Anson Weeks is the debut of the first video on this site. I encourage you to watch it, as it’s an absolute delight. Oakland-born Anson Weeks was king of the Nob Hill hotel dance bands during the 1920s and 30s, with a long run at the Peacock Room in the Hotel Mark Hopkins. During this time he also played regularly at the St. Regis Hotel in New York City. 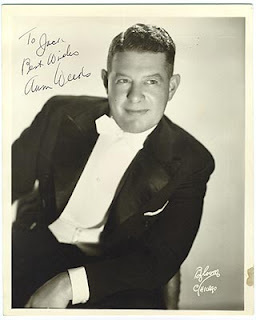 He formed his first band in 1924, and played in many famed Oakland and Sacramento hotels. In 1925, his band cut a test disc in Oakland for Victor Talking Machine Co., but, apparently, Victor executives failed to offer a contract, and the recording of “New Moon” was never issued. By the late 1920s the Anson Weeks orchestra was increasingly popular along the West Coast, because of nightly radio broadcasts. January 29, 1929 saw his first recordings as “Anson Weeks and His Hotel Mark Hopkins Orchestra” for Columbia Records. He recorded under the Hotel Mark Hopkins moniker through 1932. Weeks broadcast almost nightly in 1930 from Hotel Mark Hopkins, for KFRC, and NBCs West Coast network. His “Lucky Strike Magic Carpet” radio program was broadcast coast-to-coast from the Mark on NBC during 1931. It was while broadcasting for Lucky Strike in New York that columnist Walter Winchell coined the imperishable phrase "Dancin' with Anson." In September 1932, while Bing Crosby played San Francisco's Fox Theatre, it was arranged that he record the song "Please" from his film (released October 14) "The Big Broadcast." At that time, Weeks was an exclusive Brunswick artist, as was Mr. Crosby. On September 16, 1932 Crosby recorded this one song with Weeks' orchestra in the Mission Street studio of MacGregor & Sollie, Inc., and it would become Weeks' best-selling record. When Weeks reorganized in 1933 he phoned Crosby to ask if he had any recommendations for a male band singer. Without skipping a beat, Bing told him "I have a brother who sings like a bird." So without much preparation, Bob Crosby arrived in San Francisco, began his career at "The Mark" as a professional singer. The early- and mid-30s saw a string of hit Columbia and Brunswick recordings by Weeks, some with vocals by Bob Crosby, Carl Ravazza, Kay St. Germaine, and Dale Evans — later known as “Queen of the West,” after her marriage to cowboy star Roy Rogers. Weeks, injured in a 1941 automobile accident, left the band business, but returned in the late 1940s. 1956 brought a revival of Weeks’ career when his six-piece orchestra opened at the Palace Hotel in downtown San Francisco for a long run, and he recorded three albums for Fantasy Records. During the 60s he fronted a combo, mostly in the Sacramento area, and died there February 7, 1969. There is a great selection of Weeks’ music available on YouTube. Great research - a very interesting article! My father would have enjoyed your post. He was an exceptional musician and a very kind, thoughtful father.